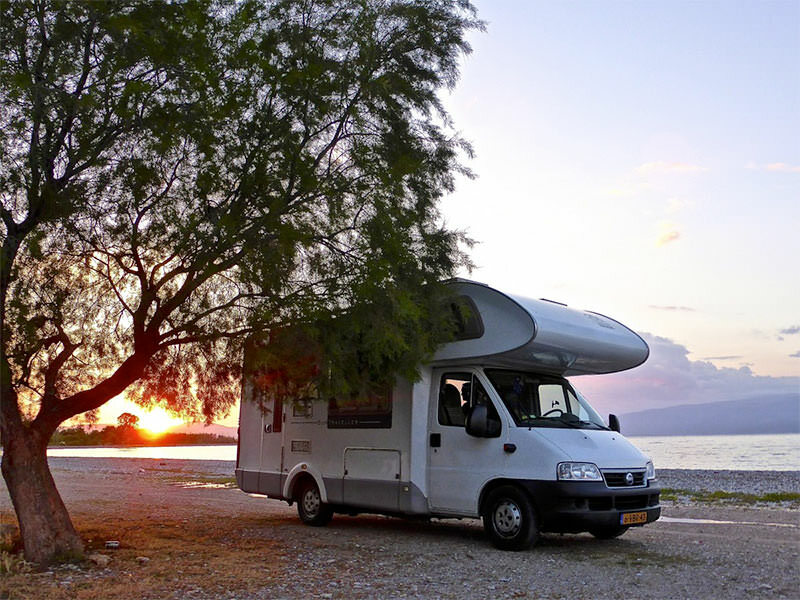 If you’re making plans to hit the road in an RV and experience the best of what the country has to offer, then first take a moment to make sure you’ve got all the equipment and gear that you need. And for an RV, a deep cycle battery is essential. For those of you new to RVing, the deep cycle battery is basically what you need for the camper to have electricity. It gives your appliances and any other electrical devices the power that they need when you’re not parked in a campsite and hooked up to 110-volt power supply. Think of it like this – without a functioning deep cycle battery, you won’t have a working refrigerator, a working air conditioner, a working heater, and worst of all, you won’t be able to get fresh water pumped into your RV’s fresh water tank. So, pretty much everything inside that RV needs this thing to work (unless you’re hooked up to electricity at a campsite). With that in mind, you might think that any old battery will do – not so! Let us help you to select the RV battery that will give you the most bang for your buck. We’ll give you everything we think that you need know when it comes to choosing the best deep cycle batteries for your RV. You’ll learn about the some of the best RV deep cycle batteries on the market with our RV battery reviews, and we’ll give you some tips on using deep cycle batteries and shopping for them. In a hurry and just want to know what we recommend? Check out the list below, or keep reading for our in-depth reviews and guide. Selecting a good deep cycle RV battery is not as simple as picking up the first one you see at a good price. Some last longer than others. Some are easier to install than others. Sometimes even the top of the line batteries aren’t that great if you don’t know how to get the right voltage by connecting them together. Honestly, it seems like there are a million things that you need to know in order to make an informed decision. So, let us clear up some of that confusion for you and help you make a good choice before your family hits the road. Starting battery: Designed to send out high bursts of energy for short periods, like when starting your car engine. Then, your vehicle’s alternator recharges it. Deep cycle battery: Designed to send out steady amounts of energy for long periods, like when powering the fridge in your RV while you drive across Kansas. They repeatedly discharge and recharge by design. If you’re interested in how deep cycle batteries work, then you might find this next paragraph interesting. A starting battery (in your car) is designed to repetitively discharge down to 20% of its capacity. But deep cycle batteries are designed to discharge down to 50% – 70% of its capacity. Then, when it recharges that energy is put back into it and the cycle restarts. You often see deep cycle batteries also being used for marine applications and in small transport vehicles like golf carts. 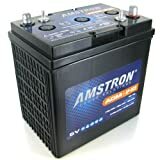 And, you can sometimes find a dual purpose battery that is both a starting and a deep cycle battery, like the Optima BlueTop Starting and Deep Cycle Battery (at Amazon), but you’re usually better off with a dedicated deep cycle battery and a dedicated starting battery for your RV adventures. 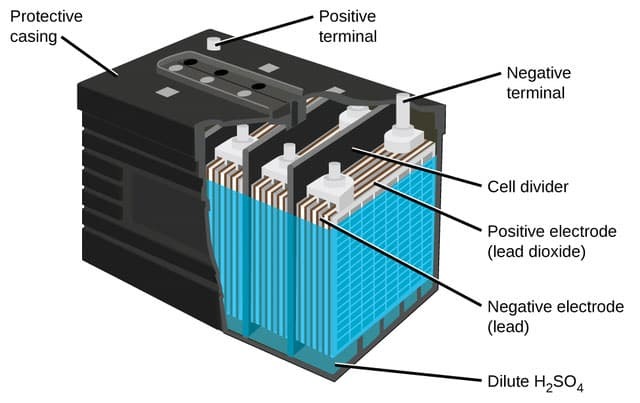 Battery Systems summarizes the differences like this: Deep Cycle batteries provide a greater reserve capacity, but cannot deliver as many peak CCA’s (cold cranking amps). Starting Batteries are made to provide high power for higher amp, more frequent short draws, and limited long term discharge. You’ll see us recommend some golf cart battery and some traditional deep cycle batteries for your RV, and that might make you wonder why that is. It’s all about voltage. Golf cart batteries are 6-volt. Deep cycle batteries are 12-volt. You see, in some instances the golf cart batteries end being more cost-effective than the regular 12-volt batteries. That doesn’t mean that every RV owner should use golf cart batteries, but some should – it just depends on your RVing style. What this really comes down to is the inside of the battery — in the 6-volt battery, there is more space per cell, which means that it can discharge deeper than any 12-volt deep cycle battery on the market. I’ve blown your mind, right? Well, there’s more! Most of the 12-volt deep cycle RV batteries that you come across are not really true deep cycle batteries. In fact, the are actually more of a hybrid battery that is a combination of a deep cycle and a starting battery. Crazy, right? Well, here’s the really crazy part — most 6-volt golf cart batteries are true deep cycle batteries! That’s why some RV owners prefer to use golf cart batteries. How do you know if you want a 6-volt golf cart battery or a 12-volt deep cycle RV battery? If your RV camping consists of traveling from one RV park to the next, then you’re just fine with the 12-volt deep cycle RV batteries. If you do more off-site camping without power hookups, then you need as mush power stored as possible and that means you need golf cart batteries – probably four to six of them for the optimal power storage setup in your RV. If you’re interested in getting some golf cart batteries for your RV, then we think that the best 6-volt battery for RVs is the VMAXTANKS 6 Volt 225Ah AGM Battery (available at Amazon). 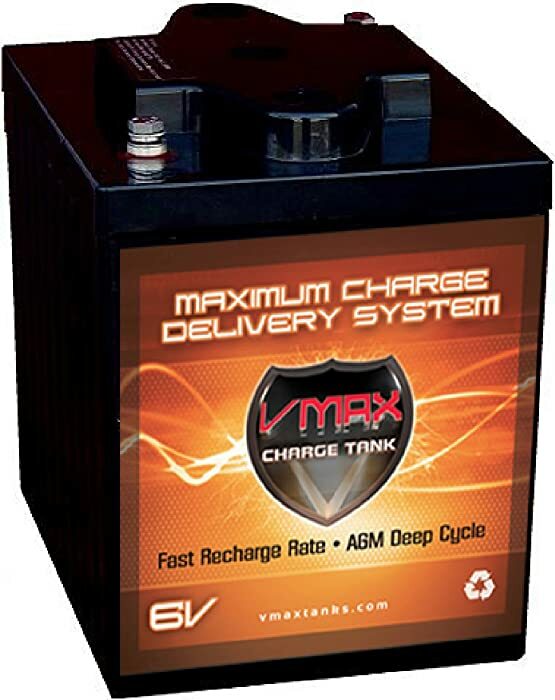 VMAXTANKS 6 Volt 225Ah AGM Battery: High Capacity & Maintenance Free Deep Cycle Battery for Golf Carts, Solar Energy, Wind Energy. 9.5"*7.3"*11"h Heavy Duty 6V AGM DEEP CYCLE BATTERY with Float Service Life span of 8 to 10 years. Electrolyte Suspension system VMAX tanks utilize an electrolyte suspension system consisting AGM (Absorbed Glass Matt) of a high porosity that totally absorb and contain the electrolyte. No silica gels or any other contaminants are used. # Maintenance Free Operation: There is no need to check specific gravity of the electrolyte or add water to VMAX tanks during float service life. In fact, there is no provision for this type of maintenance. The most commonly used of these types is the Flooded Lead Acid, probably because they tend to be the most affordable (even though they require the most maintenance). The most expensive type is Gel and we’re not fans of this type cause they damage too easily. Our favorite type is AGM because they last the longest and don’t require any maintenance. So, which type is best? That really depends you and your needs! Let’s tale a closer look at these four types to help you figure it out. With this type, you have to use them in a vented location. Regular maintenance is definitely required, as is off-season charging. These things don’t seem to do well with a lot of vibration and an upright position is a must for installation. So, why are these things so popular with RV owners? In addition to being the cheapest type of RV battery on the market, they handle overcharging better than the other two types. Also, flooded batteries offer the lowest per-amp hour operation cost of all the types, as well as the longest life span of the battery types. What’s the maintenance for this type consist of? You have to do regularly do things like equalizing the charging, watering, and cleaning the terminals. With regular maintenance, you’re looking at a good five to seven year life span for one of these. 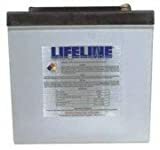 Don’t do regular maintenance or buy a really cheap flooded RV battery, then you only get around a three year life span. If you want to avoid the cheap flooded RV batteries that won’t last you as long, then shop for one of these top brands: Interstate Batteries, Trojan, or Rolls Surrette. In terms of loss average, you’re looking at around 20% loss with flooded batteries. So, you can expect around 80 watt-hours from every 100 watt-hours you put into a flooded battery. 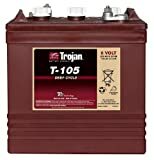 If you’re looking for the best deep cycle flooded RV battery for the money, then we recommend the Trojan Trojan 6 Volt Battery T-105 (available at Amazon). With regular maintenance, you can probably get 10+ years out of this one. We think that AGM batteries offer the best value for the money when it comes to deep cycle batteries. They require less maintenance, are stronger (charge up to five times faster) and longer lasting, and they seem to typically perform better overall. You often see AGM batteries being used not just for RVs, but also for Harleys, boats, trolling motors and more. That’s probably because AGM batteries self-discharge at a slower pace than flooded batteries, as well as handle higher temperatures. One important thing to know about AGM batteries is that they are sensitive to overcharging. That’s really the only negative they have compared to the other types. If we’ve helped you to decide that an AGM battery for your RV is the right choice, then we recommend the VMAXTANKS 6 Volt 225Ah AGM Battery (available at Amazon). We think that it is the best battery for RV to hold a charge from solar cells. If you want something that offers better performance than the flooded and AGM types, then this is what you’re looking for right here. This type offers incredible charging efficiency, with an expected 3,000 to 5,000 life cycles. This type works well in both cold and hot extreme temperatures, with a lot of performance efficiency at super low temperatures compared to the other types. This type can also be mounted and installed in any direction, which is perfect for the RVer who needs some versatility. Of course the downside to this type is the high cost, but due to the long life span this type does offer a good value for the money, despite the price tag. 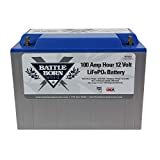 If you’re interested in getting this type for your RV, then we think that one of the best RV lithium deep-cycle batteries for the money right now is the Battle Born Batteries 100 Ah LiFePO4 12 volt Deep Cycle Battery (available at Amazon). It’s our #1 pick for the best lithium ion deep cycle battery for your RV. We’re not really fans of using Gel batteries for your RV. While there are some people who swear by them, we don’t recommend them because they have to be charged at a slower rate. And if you aren’t doing it slow enough, then you can damage them. Honestly, it is really just too easy to damage a gel RV battery and that is why we don’t think that you should use this type in your RV. For that reason, we’re not even going to recommend one for you to consider. Now that you know a bit more about all the different types of deep cycle batteries that you can buy for your RV, let our editors share some of their favorite options with you. Below you’ll find reviews on some of the top RV batteries for the money right now (according to our editors). So, if you’re still not sure which one is the best choice for you, then take a look at these reviews and see if they can help you to make a decision. Hands down, this one right here is the number one choice from each of our editors and reviewers. Yes, it is a 6-volt battery and we think that it is the best choice for your trip, especially if you’re looking for high-capacity deep cycle batteries for dry camping. Based on our editor ratings, we rate the VMAXTANKS 6 Volt 225Ah AGM Deep Cycle Battery (<–click to view at Amazon) as the best 6-volt golf cart AGM deep cycle battery currently on the market for RV owners like you and me. How many of these do we recommend that you buy for your RV travels? Well, we suggest that you go with at least 6 of these if you plan on running everything in the RV off the batteries. Obviously, more is better, so if you can afford it then go with more than six of them. What’s the life span for these batteries? You’re looking at easily getting around 8 years to 10 years from these, which you can see is a great value for the money. Why 6-volt AGM golf cart batteries? There are three 2.1v cells in the 6-volt battery. The 6-volt battery has more space per cells and the plates are thicker and will last longer. The 6 volt will be able to discharge deeper than any 12-volt deep cycle. Two 6 volt batteries will give you a lot higher amperage than one 12V battery. Leading advantages of AGM are a charge that is up to FIVE times faster than the flooded version. AGM offers a depth-of-discharge of 80 percent; the flooded, on the other hand, is specified at 50 percent DoD to attain the same cycle life. The AGM battery is also able to be installed in any orientation and stand up well to very LOW TEMPERATURES. Best thing about these? Maintenance Free Operation. There is no need to check specific gravity of the electrolyte or add water to VMAX tanks during float service life. In fact, there is no provision for this type of maintenance. Plus, their performance in low temperature conditions is consistent and superb. If you still want a golf cart battery, but prefer to go with a flooded option instead of an AGM option, then this right here gets top marks from our editors and reviewers. Obviously, one of the things that makes this a great choice for RV campers is that Trojan is probably the most well-known golf cart battery brand and they’ve built a strong reputation on high quality products, like this one. Overall, this battery has a good cycle life and you can expect it to last you around 10 years or so if you keep up on the regular maintenance for it.